It always amazes me that more is not made of our raised space. A view is one of the most prized assets a dwelling can boast but most houses (in England anyway) don’t use the 2 stories they have to provide them with a platform to enjoy a view. 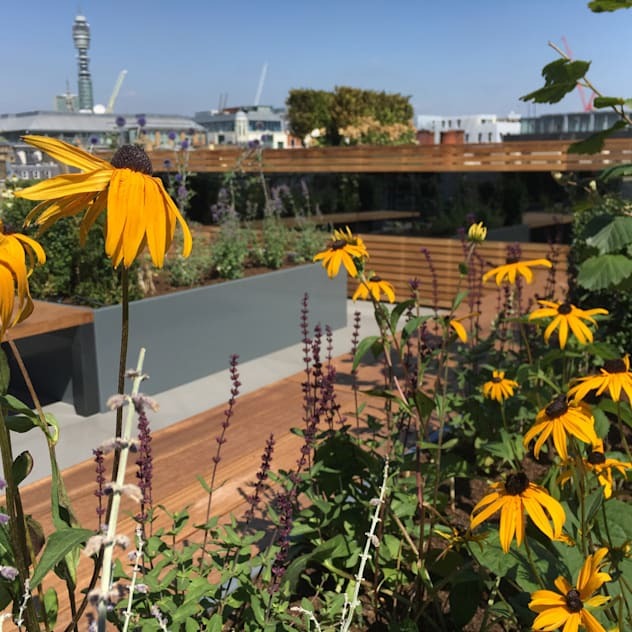 It is becoming a bit more of a trend in London and other cities to use the top space as a roof terrace and some of these views are truly fantastic. 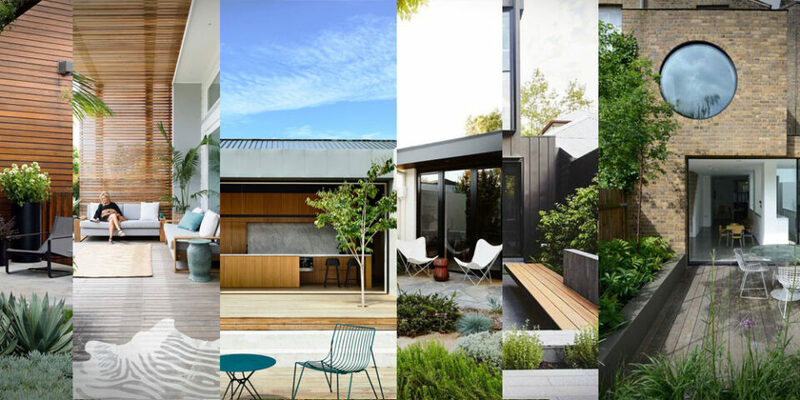 I picked out a few terraces that have great views so you can get a little bit jealous. 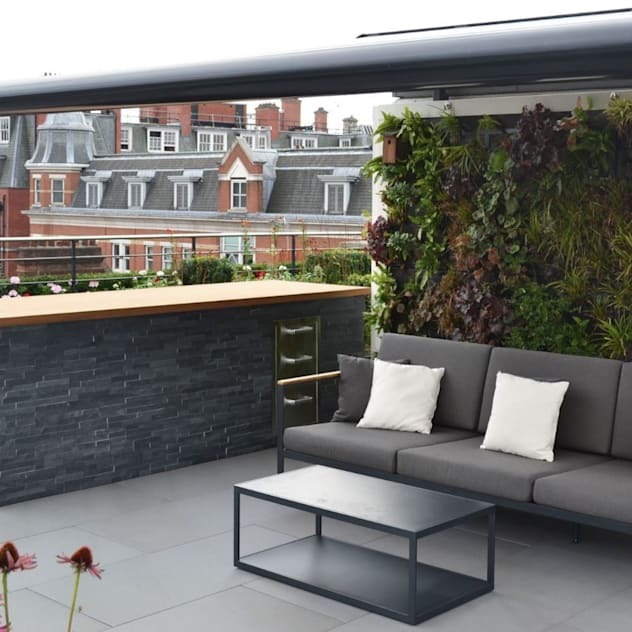 This roof terrace in London is a simple design that is back to nature. 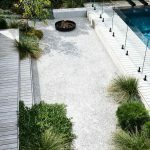 It isn’t so much the contemporary style that we are used to seeing but a bit more of a functional, natural garden with tomatoes growing and making the most of the prime location. The view is undoubtedly it’s best touch looking out over to the millennium eye and many more top sites. We aren’t privy to the view of this place but it is very evocative of what we know to be a Mediterranean villa with their great use of terrace spaces. 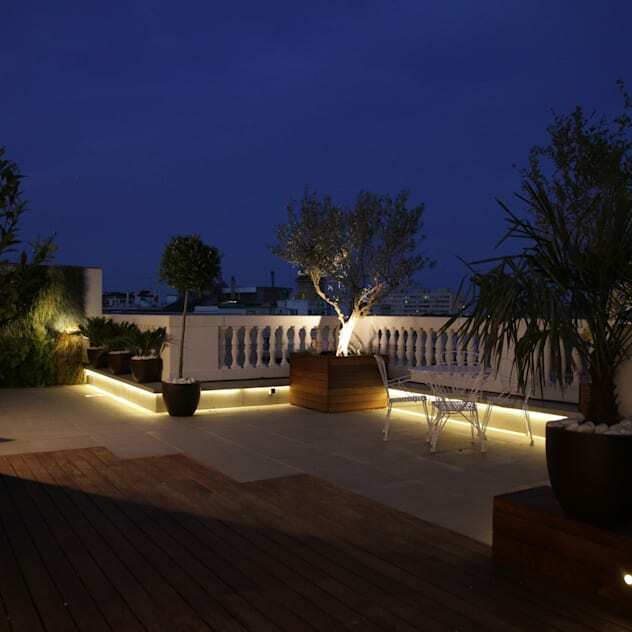 The white washed walls and double area terrace make for an inviting , mood lit space to while the evening away. This terrace is a very classy affair. 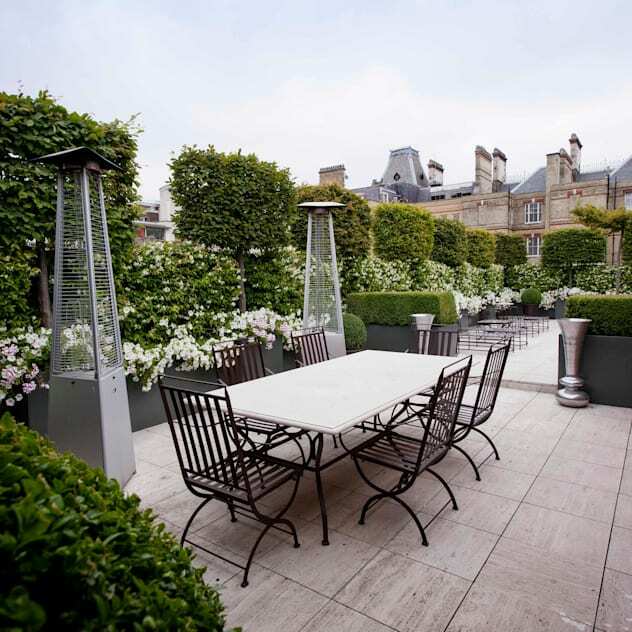 The perfectly pruned hedges set in mid height planters keep a very simple colour theme of white and green which complements the table top and tiles perfectly. The hedges to the side provide some privacy for the owners though the offset of that is limited views so perhaps this example has none. 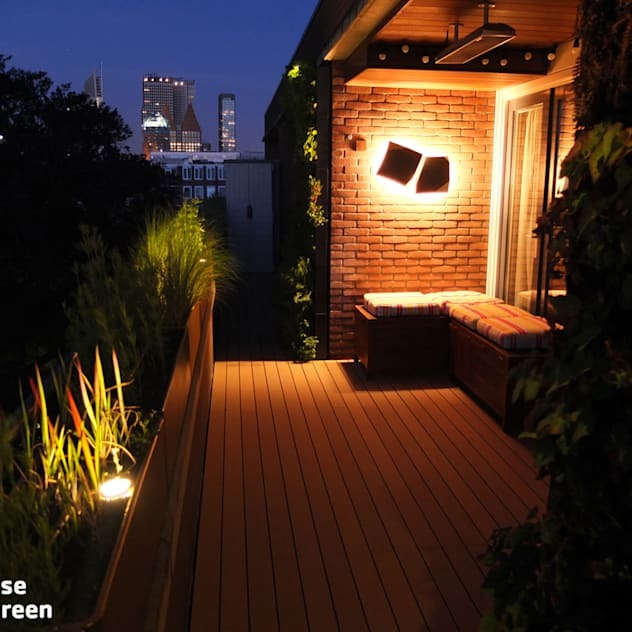 Everything looks better in the dark but this terrace looks really nice with the lighting setting off the edges and picking out specific plants in the surrounding foliage. The view over the wall is also a nice feature as the terrace sits higher than many buildings so peaks out over the town. The large open space means that this terrace can be used for many different things and a social gathering out here in the summer would be a stunning event. 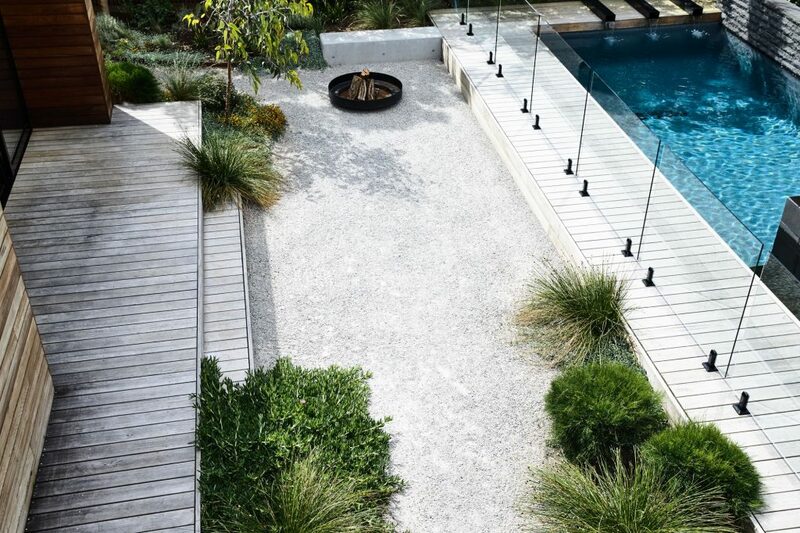 A bit more of a mood shot with this image and design but the combination of wood, concrete and metal planters gives a stylish and modern aura. 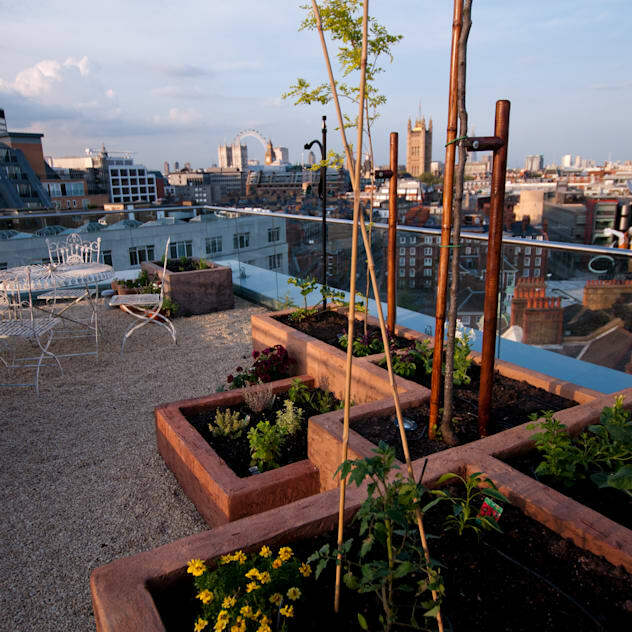 The garden looks perfect with the yellow accents in the summer sun and a view of London. This is very different to the terraces that have come before but when I saw it I suddenly needed a holiday! Not all places are suited to a swimming pool at the seas edge but in a warm climate why not. 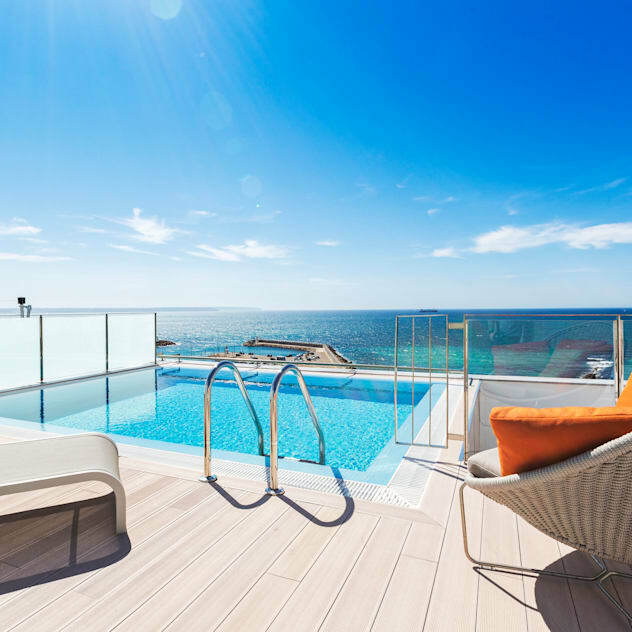 The pool dominates the space but there is still space for sun-loungers and with a view like that we can forgive the absence of foliage and decoration I think. Again a different terrace this time set in a countryside environment and enjoying views of the tree tops into the sun. The huge sofa is unapologetic for taking most of the outdoor space with it’s extra leg space so the owners can really slouch out and relax in the sun with their bottle of wine on ice. I’m quite sure they have fallen asleep there on many occasions and woken up cold. 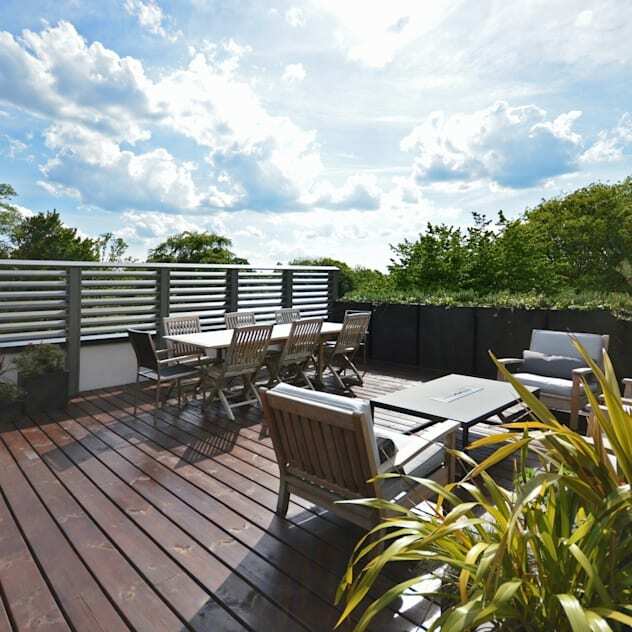 It isn’t often that dark wooden decks are used but this spacious terrace does just that. It has room for a large dining table and social space to the side so the owners can migrate once the food is done with. 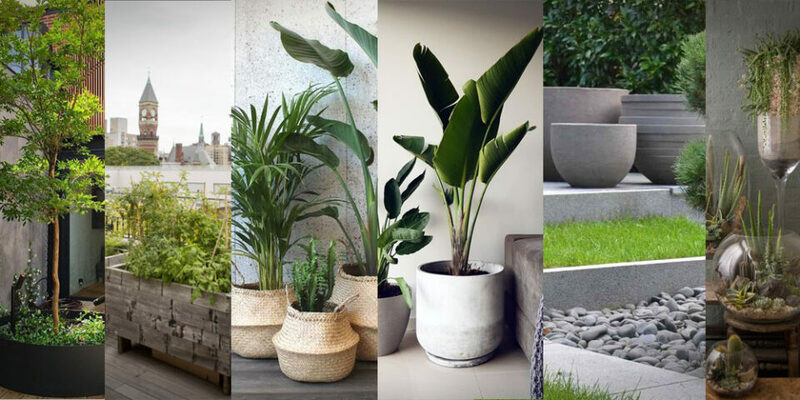 The use of box planters around the edges enables a bit of greenery and shelter and give the outdoor space a bit of life.